Spacious charming 4-bedroom villa for up to 10 guests situated in enchanting forest zone, only 60 m away from the sea. Quiet beach, cleanest sea, cypresses and juniper around, mountain and sea view. Villa Akti is situated in enchanting forest zone of southern part of Rodos. The house is only 50 m away from the crystal clean sea and 4 km away from Gennadi village. The house has 1 and 2 floors and an apartment at the ground floor. There are 4 bedrooms, 1 additional sleeping area for 2 persons, 4 bathrooms and wash corner, 2 sitting rooms with fireplace and 2 kitchens. All house is air-conditioned, with internet access and satellite TV, telephone. The ground floor apartment has bedroom with 2 single beds; traditional style living area with fireplace; fully equipped kitchen; dining area and additional sleeping place with an extra-large traditional Greek bed and 2 bathrooms with WC. The first floor has living room with fireplace; bedroom with a big double bed; bathroom; wash corner with toilet; fully equipped kitchen with electric stove, fridge, dishwasher, coffee machine and all necessary kitchenware. The first floor has two big verandas facing the sea and the forest zone. There is an inner staircase which leads to the second floor. The second floor has two bedrooms - one with nicely decorated double bed with marvelous sea view, and another with two single beds and veranda facing the sea; big bathroom with shower, toilet and washing machine. Villa can provide a nice baby-cot for its little guests. Depending on the number of guests we can offer 3 rental options. 1: All house including the ground floor apartment (up to 11 guests). Available from April to November. 2: The house without the apartment (1 and 2 floor) (up to 7 guests). Available from April to November. 3: The ground floor apartment (up to 4 guests). This option is not available for June, July and August and can be rented as a separate apartment in April, May, September, October and November. Since any option is booked, no other premises at the villa can be booked by other guests. The villa cannot be rented to more than one party of guests, so the privacy of our guests is guaranteed. Cleaning of the house and linen change once a week. The villa has a beautiful garden with lemon trees, pomegranate and fig trees. The big cozy terrace is next to barbeque area, where guests will find a wood oven, grill, sink with cold and hot water, dining table with chairs and all the necessary utensils (plates, glasses, etc) to make their party easy and nice. On the way from the beach to the house there is an outdoor shower. The villa has parking space enough for 4 cars. 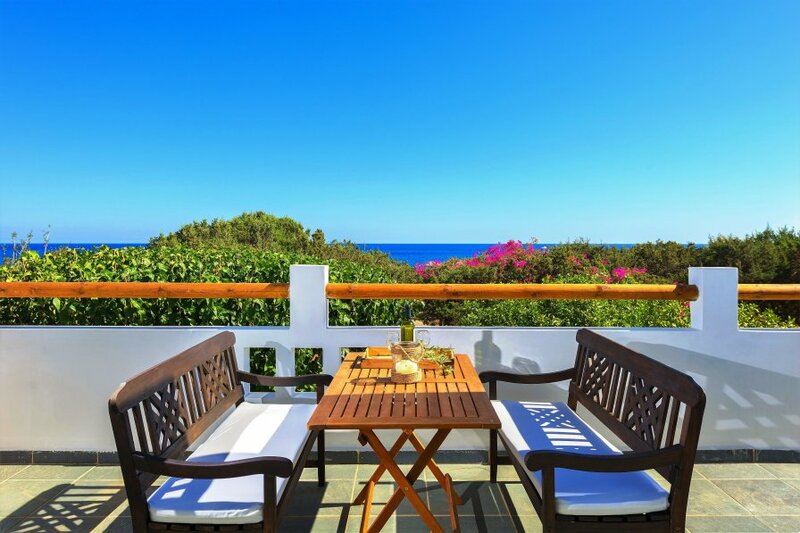 At the fine-shingle beach the guests will find private sun canopy with sun beds and sun chairs. 600 m away from the villa there is a Mojito beach cocktail bar, the guests can take a walk (or swim)there along the sea line, or use their car to get there. The villa is situated at the protected picturesque forest area bordering the sea, just 4.2 km away from the charming Gennadi village with its old traditional houses, narrow streets with taverns offering traditional Rhodian food. There is a supermarket offering meat and poultry, drinks, cheese, cold cuts and household items at very good prices, grocery shop and bakery at the central square of the village. There is also Church, pharmacy and Medical First Aid Station. Our guests can visit Lachania village with its beautiful beaches, a picturesque place 5 km away from the villa. Prassonissi cape is an ideal place for surfing. Tourist Kiotari centre (shopping, restaurants, bars, excursions) is 10 km away from the Villa. To go to Rhodes town (the capital of the island), or to famous Lindos (Pefki, Lardos) use regular bus service Gennadi-Rhodes.